Built as a project by ICI students in 1984. 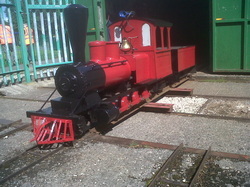 Based on an Irish peat railways design, GERALDINE was designed by member Len Hough specially for Halton. 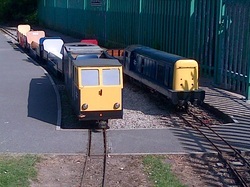 HALTON CASTLE (left) and CLASS 20 (right) stand in Mousetrap Hall Station awaiting more passengers. New build by Society members from a design by Leyland Society. These 6 coaches are air braked and fitted with padded seating...our standard for the future. All steel body, powder coated in Oxford Blue, very comfortable. 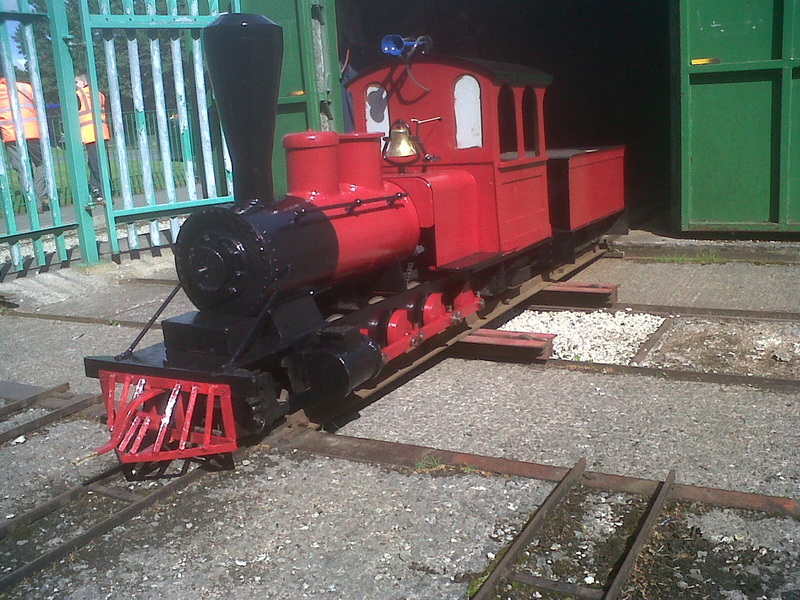 Built in 1976 and originally used on portable tracks at shows in the North West, Pixie was the first locomotive to run at Halton. Unused since the early 1980s, when more powerful locomotives arrived, PIXIE has been refurbished and will run special trains through the year. PIXIE has a petrol engine and 'forward' and 'reverse' mechanical gearbox. 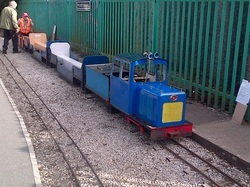 The locomotives and coaches used at Halton belong to both the Society and to individual members. Trains are normally 2 or 3 carriages in length, carrying upto 20 passengers. 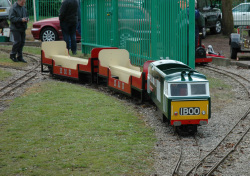 Members will also often bring their own steam, petrol, and electirc locomotives to run. The Society owns 7 coaches, with another 6 privately owned available for use. 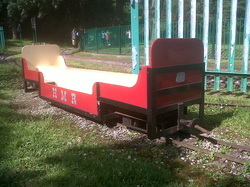 The Society also owns 2 ballast wagons for maintenance work.